Don’t burn through your Atlanta natural gas budget before winter’s over! Save money by switching providers now! Great Time To Switch Natural Gas Providers! Natural gas usage has spiked sharply during the recent cold weather as people across the Atlanta Gas & Light service area struggle to keep their homes warm. However, prices for natural gas have still stayed low. That makes this the perfect time to pick up a cheap fixed rate natural gas deal before prices rise again. Doesn’t Winter Mean High Prices? It’s a well-known law of the market that when demand increases, so do prices. However, despite natural gas demand shooting up by almost 40% prices have remained in a deep slump. How does this make sense? Well, this winter has seen a lot of ups and downs for the natural gas industry. First, natural gas reserves were at their lowest for more than a decade, prompting fears of a winter shortage. This was met with a surge in natural gas output. But warmer than normal winter weather kept natural gas prices fairly low even though there has been sporadic periods of robust demand. Even though natural gas prices have reached highs of almost $7/MMBtu, they’ve remained below $3/MMBtu since the end of January. Why Didn’t Prices Rise After The Polar Vortex? Historically cold weather must mean Georgia is consuming a huge amount of natural gas, right? Of course – and this state uses quite a lot anyway; nearly as much natural gas is delivered to residences in Georgia as in Texas. However, late January’s polar vortex visit was short-lived and subsequent rounds of bitter cold never materialized. Demand slumped as soon as warmer temperatures moved in and prices fell, too. While some parts of the country are predicted to experience frigid temperatures in the short term, Georgia will escape cold weather and have more moderate temperatures going into March. This means prices are staying low . . . for now. Cold weather isn’t gone, but you chance to pick up a cheap natural gas fixed rate deal now before prices rise again. There are plenty of great plans around that can save you money on your bills; the Constellation 12 Month Metro Home plan is a great example, with a low rate of just $0.369 per therm. 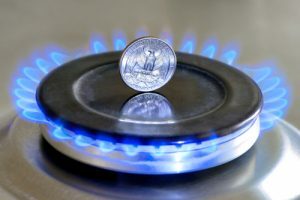 If you’re not a heavy user of natural gas, perhaps the XOOM Energy SureLock 12 is a better option, since the monthly service charge of $5.85 is more than $2 cheaper than Constellation’s plan.